Although the purpose of antiarrhythmic drugs is to control arrhythmias, these medications may also cause arrhythmias and confusing ECG changes. ECG changes and arrhythmias caused by digoxin was discussed previosly. Below follows a rather detailed declaration of ECG changes, arrhythmias and conduction defects that occur due to antiarrhythmic drugs, beta blockers and calcium channel blockers (inhibitors). The reader will notice that most these drugs are contraindicated in patients with structural heart disease, as well as patients with reduced left ventricular function. This is because these patients are at particularly high risk of developing life-threatening arrhythmias. Prophylaxis and treatment of symptomatic ventricular tachyarrhythmias. Prophylaxis and treatment of atrial fibrillation. AV system (AV node, His bundle, Purkinje system) Preexisting AV block, bundle branch block or fascicular block may become worse. Particularly, the degree of AV block may increase. QRS complex QRS duration becomes prolonged. ST segment ST segment depression may develop. T-wave T-wave may diminish in amplitude. QT (QTc) interval QT and QTc interval becomes prolonged. Arrhythmia Disopyramide may provoke or aggravate any ventricular arrhythmia, such as ventricular tachycardia, ventricular fibrillation, torsade de pointes etc). Hypokalemia is likely to predispose to the pro-arrhythmic effects of disopyramide. Structural heart disease also increases the risk of developing arrhythmias during disopyramide treatment. Propafenone and flecainide are both class I antiarrhythmic drugs and share several characteristics. Prophylaxis and treatment of life-threatening ventricular tachyarrhythmias. Propafenone is usually not the first line therapy in this patient category. 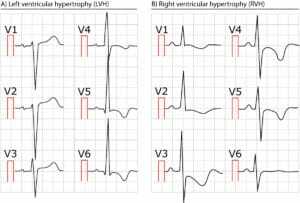 Prophylaxis and treatment of symptomatic paroxysmal supraventricular tachyarrhythmia in patients without evidence of structural heart disease. Propafenone is usually not the first line therapy in this patient category. Cardioversion of atrial fibrillation in patients without structural heart disease (reduced left ventricular function is considered a structural heart disease). AVNRT, AVRT (WPW syndrome) and other conditions involving an accessory pathway. Paroxysmal atrial fibrillation in patients with severe symptoms, provided that first line therapies have failed and the patient does not have structural heart disease or reduced left ventricular function. Persistent or non-persistent ventricular tachycardia or frequent premature ventricular contractions that cause pronounced symptoms and other therapies have failed. Patients with structural heart diseaes or reduced left ventricular function are not eligible. Effect on sinoatrial (SA) node Flecainide has no effect on the activity in the SA node. Propafenone may decrease automaticity in the SA node and thereby lower heart rate. AV system (AV node, His bundle, Purkinje system) PR interval is prolonged. AV block occurs occasionally. QRS complex QRS duration is prolonged. QT (QTc) interval May be prolonged. Amiodarone is the most potent antiarrhythmic drug available. ECG changes develop gradually and may come to full expression first after 6 weeks treatment. The main electrophysiological effect of amiodarone is lengthening of the refractory period. Serious ventricular or supraventricular tachycardia owing to WPW syndrome, atrial flutter or atrial fibrillation. Amiodarone is only considered after failure of first line choices. Catheter ablation is generally considered before considering amiodarone. Effect on sinoatrial (SA) node Decreases automaticity in the SA node. Sinus bradycardia is a common side effect. AV system (AV node, His bundle, Purkinje system) No significant effect besides prolongation of PR interval. QRS complex May be prolonged. U-wave May become more pronounced. QT (QTc) interval Becomes prolonged. Arrhythmia Sinus bradycardia is very common. Approximately 1% to 5% develops torsade de pointes due to QT prolongation. Sotalol is a class III antiarrhythmic drug which also exerts beta blocking effect (it inhibits beta adrenergic stimulation). Sotalol should not be confused with conventional beta blockers (which have no effect on heart rhythm), because the drug has profound pro-arrhythmic effects owing to its prolongation of the QT interval. Prophylaxis and treatment (also in acute setting) of ventricular tachyarrhythmias. Prophylaxis and treatment (also in acute setting) of supraventricular tachyarrhythmias. Rhythm control in atrial fibrillation (or atrial flutter) after return to sinus rhythm. Effect on sinoatrial (SA) node Decreases automaticity in the SA node. Sinus bradycardia may occur. QT (QTc) interval Becomes prolonged. Normally the prolongation ranges between 20 and 100 milliseconds. Arrhythmia QT prolongation may cause torsade de pointes (polymorphic ventricular tachycardia). The risk is particularly high at low heart rates. The beta blockers need little introduction. Beta blockers reduce the effect of catecholamines on the heart. This results in negative inotropic effect (decreased heart rate), negative bathmotropic effect (decreased conductivity) and negative chronotropic effect (decreased heart rate). Decreased heart rate will prolong diastole, which improves myocardial perfusion (the ventricles [particularly the left ventricle] are perfused during diastole). The negative inotropic effect (meaning that the contractility is diminished) results in decreased myocardial oxygen consumption, which is beneficial. Although beta blockers do not exert any direct antiarrhythmic effect, they may reduce the incidence of arrhythmias by blocking the pro-arrhythmic effect of catecholamines. For example, beta blockers have an astonishing effect in reducing the incidence of ventricular tachycardia among patients with congenital LQTS (long QT syndrome); these patients are very sensitive to cathecholamines. Hypertension. Angina pectoris. Secondary prevention after myocardial infarction and unstable angina. Supraventricular tachyarrhtyhmias (e.g atrial fibrillation), with the aim of reducing ventricular rate. Premature ventricular beats. Premature atrial beats. Effect on sinoatrial (SA) node Decreases automaticity in the SA node. Sinus rate is decreased. AV system (AV node, His bundle, Purkinje system) PR interval may be prolonged. Development of AV block indicates underlying AV node disease (which will typically become clinically overt sooner or later). QT (QTc) interval May become shortened. Arrhythmia Has no pro-arrhythmic effects. The most clinically relevant rhythm effect is the slowing of heart rate and particularly ventricular rate. First line therapy in patients with atrial fibrillation and atrial flutter. Verapamil and diltiazem are the most widely used calcium channel blockers. Secondary prevention after acute coronary syndromes, if beta blockers cannot be used. Supraventricular tachyarrhythmias: atrial fibrillation, AVNRT. Calcium channel blockers are second choice also in these settings. Calcium channel blockers must never be used in atrial fibrillation with simultaneous pre-excitation, as it may cause ventricular fibrillation. Effect on sinoatrial (SA) node No effect unless there is underlying SA node disease (sinus node dysfunction). In case there is sinus node dysfunction, calcium channel blockers may cause sinus bradycardia or even sinus arrest. AV system (AV node, His bundle, Purkinje system) PR interval becomes prolonged, but second- and third-degree AV block is uncommon unless there is pre-existing AV nodal disease. Arrhythmia Has no pro-arrhythmic effects. The most clinically relevant rhythm effect is the slowing of heart rate and particularly ventricular rate. Second line therapy in patients with atrial fibrillation and atrial flutter. Must never be used in atrial fibrillation with concomitant pre-excitation (WPW syndrome), as discussed previously. Chou’s Electrocardiography in Clinical Practice by Surawicz B, Knilans T.
Clinical Arrhythmology and Electrophysiology: A Companion to Braunwald’s Heart Disease by Zipes D et al. Electrophysiological disorders of the heart by Camm AJ et al. 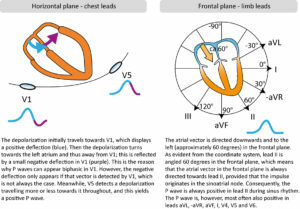 Marriott’s Practical Electrocardiography by Wagner GS et al.